Where do most cases of Lyme disease occur? In the United States, Lyme disease most commonly occurs in the Northeast, mid-Atlantic regions, and in the upper Midwest. These areas are near water sources and contain highly wooded areas, which are prime environments for breeding ticks. Lyme disease is spread by the bite of an infected deer tick. The tick must usually be attached to a person for at least 24 hours before it can spread the germ. Deer ticks are capable of spreading more than one type of disease causing bacteria in a single bite. Lyme disease can occur during any time of the year. The disease can appear at an age, affect any gender, and may show different symptoms case by case. Young ticks (nymphs) are most active during the warm weather months between May and July. 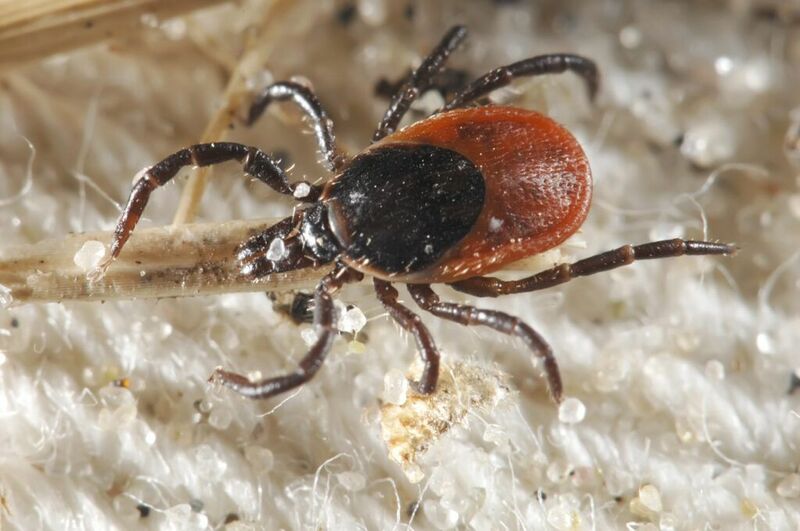 Adult ticks are most active during the fall and spring, but may also be out searching for a host any time as long as winter temperatures are above freezing. Early stage (days to weeks): The most common early symptom is a “bulls-eye” rash (erythema migrans) which occurs usually where the tick was attached. It often, but not always, starts as a small red area that spreads outward, clearing up in the center so it looks like a donut shape. Flu-like symptoms, such as fever, headache, stiff neck, sore and aching muscles and joints, fatigue and swollen glands may also occur. Even though these symptoms may go away by themselves, without medical treatment, some people will get the rash again in other places on their bodies, and many will experience more serious problems. Treatment during the early stage prevents later, more serious problems! Later stages (weeks to years): If untreated, people with Lyme disease can develop late-stage symptoms, even if they never had a rash. The joints, nervous system and heart are most commonly affected. People who are diagnosed with Lyme disease can be treated with antibiotics, either intravenously (IV) or orally (by mouth). 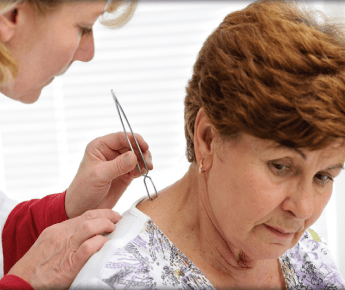 Treatment should begin as soon as possible to prevent progression of the disease. Use a repellent with DEET (the chemical diethylmetatoluamide) or permethrin according to the instructions given on the product label. DEET products should not be used on infants under two months of age and should be used in concentrations of 30% or less on older children. Permethrin products are intended for use on items such as clothing, shoes, bed nets and camping gear, and should not be applied to skin. More information on choosing a repellent and how to use repellents safely is included in the MDPH Tick Repellents fact sheet at www.mass.gov/dph/tick. If you can’t go online, contact the MDPH at (617) 983-6800 for a hard copy. Several tests are available for a diagnosis of Lyme disease. These include direct and indirect tests. Indirect tests look for the patient’s immune response to B. burgdorferi. Direct tests look for the presence of B. burgdorferi antigens or nucleic acids. – Indirect Tests – Lyme Serology Tests (ELISA, IFA, and Western Blots) The Lyme ELISA test measures B. burgdorferi IgM and/or IgG antibodies present in the patient’s serum sample. The sensitivity and specificity of these tests is about 70%. The Lyme IFA (performed as part of a Lyme Panel) detects IgG, IgM and IgA antibodies against B. burgdorferi. Antibodies to B. burgdorferi are detected about 2-3 weeks after infection and may remain elevated for a long time in some patients. The LYME WESTERN BLOTS (IgG and IgM) detect antibodies to B. burgdorferi, the causative agent of Lyme Disease. In some cases, the testing laboratory may be able to say that your “picture of Lyme antibodies” is consistent with early, late, persistent and/or recurrent disease. Unlike other diseases, IgM antibodies may persist for a very long time. Antibodies can be detected within one month of infection (usually IgM) and can be up to 25 years after an initial infection (IgG only; IgG and IgM; or IgM only). About 20% -30% of patients never make antibodies. Some patients with a “normal immune system” may not have made antibodies at the time of testing. Thus, the presence of antibodies alone does not make a diagnosis of disease. – Direct Tests – The Lyme Dot Blot Assay (LDA) detects antigens of Lyme bacteria in urine samples. There is cross reaction to some of the pathogens present in urine samples. This test can be performed on urine samples and cerebral spinal fluid. The Lyme Multiplex PCR (Polymerase Chain Reaction) Test, is a highly specific and sensitive test that can detect the presence of the DNA of the Lyme bacteria. The PCR test is often the only marker that is positive in all stages of Lyme disease. The test can be performed using the patient’s blood, urine, CSF and/or miscellaneous fluids or tissues. Unfortunately, Lyme bacteria like to “hide” in the body, therefore, PCR can be a false negative. Studies performed on different sample types suggest that performing PCR on multiple sample types (e.g. blood and urine) improves assay sensitivity. Therefore, in the Lyme panels, PCR on whole blood and serum is included to improve sensitivity. For patients with clinical symptoms of Lyme disease who test negative by the IFA Screen or IgG/ IgM Western Blots, the PCR on serum and whole blood or the LDA/Multiplex PCR Panel on urine may be appropriate. There are physician developed antibiotic protocols to enhance the sensitivity of the LDA. Lyme Panels have been put together to provide cost saving options to the patient when more than one test is ordered. The panels are listed on our Patient Test Requisition Form, including Co-Infection Panels for certain regions of the country you live in or may have visited. This information can be found at www.igenex.com which specializes in Lyme disease and associated tick-borne diseases with over 20 years experience.